Lakshmi Bharadwaj contributed to this article. See updated stem cell journal list for 2018 here. Important update on April 22, 2016. There are an increasing number of predatory journals out there and some use “stem cells” as a hook. This list is not an endorsement of these journals and in fact on a continuing basis if I hear concerns that some here are predatory I will delete them. I may also do a new post on this. 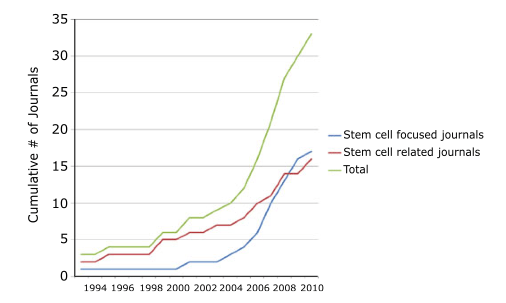 With the excitement surrounding stem cells perhaps it is not a shocker that the number of journals specifically focused on stem cells has rapidly grown, but the rate of growth is still very striking. In this piece we focused on producing a definitive list of stem cells. Stay tuned later this week for my goofy list of made up stem cell journals. I think you’ll laugh. Some have even asked if this rapid proliferation of stem cell journals is such a good thing. Paul Sanberg and Cesar Borlongan even published an article on this phenomenon in, you guessed it, one of the newer stem journals in 2010, Stem Cell Reviews and Reports. See a figure snapshot below from their paper showing the trends. Many similar stem cell journal names are apparent as well (more on that below). Are there really that many stem cell journals that we need ones with such similar names? We have our favorites of course that have been around a while and have earned their stripes including Cell Stem Cell (Impact factor around 25) and Stem Cells (with my awesome colleague Jan Nolta of UC Davis as Editor-in-Chief; impact factor nearing 8) as well as the Stem Cells spinoff that has been very successful, Stem Cells Translational Medicine. Regenerative Medicine is a great one with an impact factor of 3.873 (disclosure: I’m on the editorial board). There is also Stem Cells and Development, which has published an increasing stream of very cool, higher impact stuff. It has an impact factor of about 4.7 these days. Another journal called Stem Cell Research has been doing pretty well with a 5-year impact factor of 4.467. Way to go! But now there are a whole slew of stem cell journal newbies. Are they any good? Are they good for the field? I can safely predict that the new ISSCR journal, Stem Cell Reports, is going to be a big success, but I’m not so sure about the other newbies. Some are likely to work out, while others will probably fade away. It’s also again confusing that so many journals have almost the same names. Here is a fairly comprehensive stem cell journals list. I’ve left off those which seem defunct or inactive in 2013. Journal of Stem Cells….and not to be outdone….. Stem Cells and Cloning ….and not to be outdone….. Stem Cell Research & Therapy…..not to be confused with…. I don’t believe this plethora of stem cell journals is necessarily good for science. I imagine that over time “publishing evolution” will eliminate some of them, but the enthusiasm for stem cells is likely to germinate more new ones to take their places. Of course many more general journals such as Nature, Nature Medicine, Cell, and others publish outstanding stem cell research papers as well. If you know of other stem cell journals (active ones only please) that we missed, please let me know the name of the journal its website. Which ones are Open Access? Is there a PLoS – Stem Cells? Thank you for this interesting post, Paul. I would like to introduce myself as the In-house Editor for Stem Cell Research & Therapy, and provide a little more information about the journal, as we agree that with the ever increasing number of journals it can be difficult for readers and authors to distinguish between the newer journals. Stem Cell Research & Therapy is published by BioMed Central and was launched in 2010 as the first journal to focus on translational stem cell research. Stem Cell Research & Therapy was also the first open access journal in the field to be indexed by MEDLINE and has an official Impact Factor of 3.65. Both BioMed Central and the Editors-in-Chief Professors Rocky Tuan and Timothy O’Brien are committed to the development of the journal and we welcome any feedback from the community.